This year our hybrid apple tree gave us a good bounty of fruit. Last year we used a few apples to make this delicious Minced green apple pickle, which turned out sooo good that we had to do the same this year. With the remaining apples I was thinking cake, I already have one tasty recipe for an Apple and walnut cake which I make very often, but my newly found admiration for Linda Collister's bakes saw me baking this moist, scrumptious and delicious apple topped almond loaf cake. 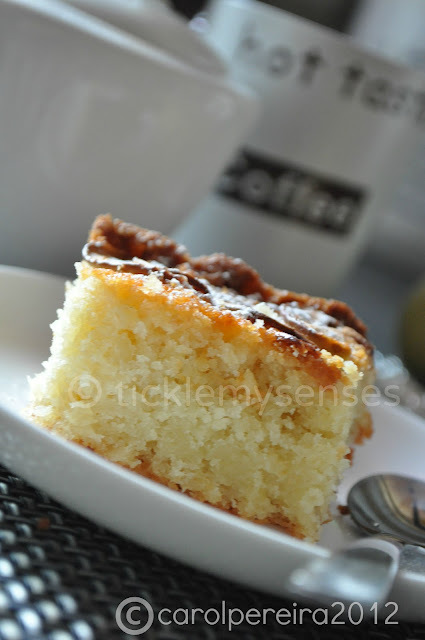 You must check out her awesome and impressive Coconut blondies. 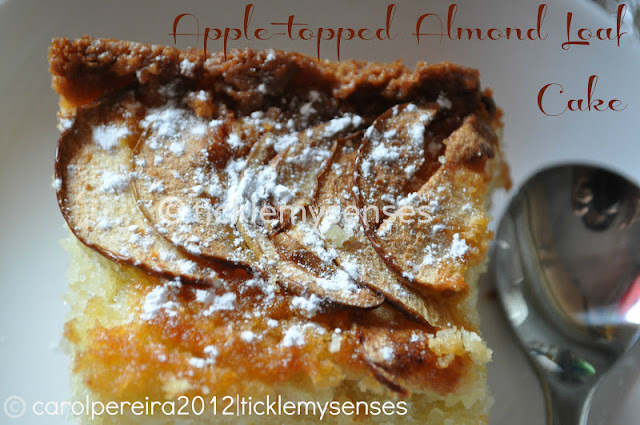 This apple-topped cake with ground almonds, has a lovely texture and a very moist crumb. The apples adds a wonderful healthy topping. Although the original recipe calls for red eating apples, I used Granny Smith cooking apples, and I think the cake was still wonderful. A 450g loaf tin greased and lined with baking paper. 1. Beat the butter and sugar together in a large bowl with an electric whisk until smooth, light and fluffy. Add the eggs an little at a time , stirring well between each addition. 2. Stir in the almonds, flour and baking powder., stir in the lemon zest and milk. Spoon the mixture into the prepared loaf tin and level the surface. Arrange the apple slices evenly over the top. 3. Bake the cake in a preheated oven for about 45 minutes until the cake has risen, golden and springy to touch and a skewer inserted into the centre of the cake comes out clean. Leave to cool for 20 mins then turn over onto a wire rack and peel off the paper, allow to cool completely. 4. 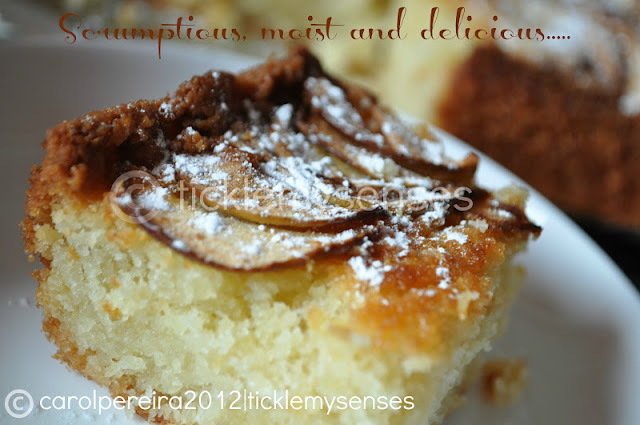 Dust liberally with icing sugar, cut into slices. Store in an airtight container in the fridge and eat within 2 days. 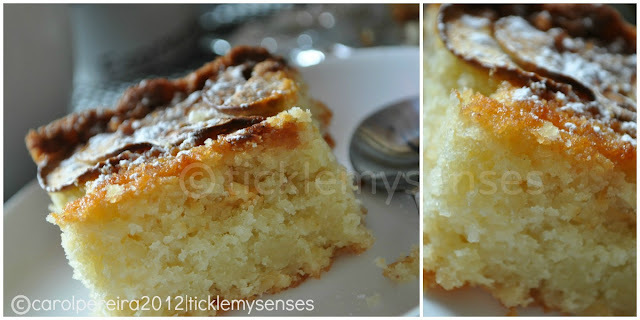 This cake makes a lovely tea time or lunch box treat. Alternatively makes a good dessert option when served with vanilla icecream. Hi Carol. This cake is beautiful. I have three apple trees but unfortunately a heavy rainy year ruined them with some kind of disease called "fire blight" so I did not get any apples for 3 years now. But apples are wonderful. Recently I was maing pancakes and had a little batter left over. I cored, peeled and sliced an apple and threw them into the owl of pancake batter. Then I put the coated slices on the griddle and cooked them. They were better than the pancakes. I just noticed that you commented on my Buffalo Wings post and asked for hot sauce suggestions. Almost any bottled sauce is fine, such as Crystal or Tabasco brand. A piquant red pepper in vinegar concoction is what you want. The Almond loaf cake is really superb, Thank You. I love this cake, especially the topping. Comforting Chicken Soup for little ones.